who presided at the formal dedication of the $75,000 Carnegie library last night. Mayor Q. H Bentley, who presented the library to the citizens of Wichita and gave the address of welcome, reviewed the pioneer life of Kansas, the place of Wichita in the state and the place of the library as the general melting pot of the people of the city. He touched upon the part Judge E.B Jewell played in the early library and the lyceum course work of the city and quoted from the speeches made by Brewer, the member of the supreme court from Kansas, and of Noble Prestiss, at the first lyceum course ever held in Wichita. In the early eighties the Sedgwick county library the I.C. 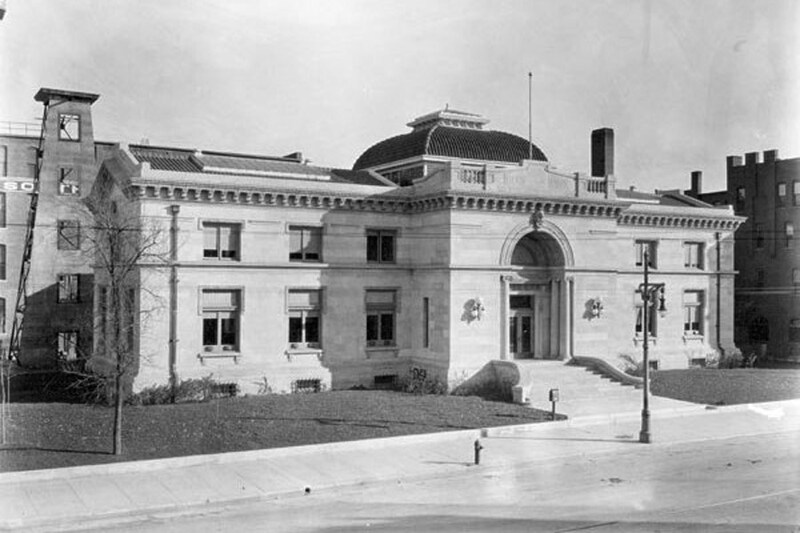 Library and the Tuttle library were united and placed in a room on Douglas avenue near the Old Eagle building according to E.M Leach president of the library board who gave the historical sketch. Two years later it was moved to the office of the secretary of the board of education on the fourth floor of the city hall and about 1900 moved to the second floor in the room occupied at present by the city engineer. In 1910 the city council voted $600 for its maintenance. From the time it was moved from Douglas Avenue it was under the board of education. In 1911 the school board moved the most valuable books and latest references in the new high school building and the city for the first time took over superintendence of the library. For a long time the institution was a pay library. About 1910 it became free. Mrs. Anna Brickman formally Miss Anna Weigand, librarian from 1890 to 1907 worked for $10 a month in the beginning according to a statement made by her commenting upon Mr. Leach’s sketch after the program. The public library is the one institution in a city that is open to all classes and all cults, according to F.I. Allen who gave an address on the place of the library in the civic welfare of the city. Its place is to minister to the citizens and to open to all classes the program of culture. The intellectual growth is as much a factor and should be as carefully cared for as the health of the city. The health of the citizens is guarded whether they want it guarded or not and just as stringently intellectual development should be forded upon them, despite their objections. Julius Lucht, the new librarian, talked of the willingness of the library staff to assist the people of Wichita in their selection of books and articles, and in their research work. After the benediction, which was given by Dr. Walter Scott Priest, the library was shown to the visitors, by the following: Mrs. Henry Larkin and Mrs. J.F. Carpenter, who showed the restroom and the witchenette for use by the library staff; Miss Elizabeth Sprague, who explained the paintings, Mrs. L.S. Trotter, in charge of the board room; Mrs. H.W. Wattles who showed the restroom and kitchen; C. Wicham and Mrs. C.E. Mahaney is in charge of the exhibit room; Mrs. Henry Ware Allen and Miss Dora Buckner, who explained the catalogue of the children’s room; Julius Lucht and W.S. Hadley who had charge of the general reading room; Miss Ada Thacher and Mrs. W.K. Jones who were at the general delivery desk, and Mrs. Ella Vaughn who explained the catalogue system in the catalogue office. Rafael Navas waited for an Inspiration from the program before he decided what piano selections he should give, deciding upon Liebestraume, by Liszt, and Chopin’s “Polonaise.” both suggestive of kindness; this following our Mayor Bentley’s opening quotation, Miss Marcia Higginson gave a vocal solo, “A Song of Rain,” which was written by her mother, Mrs. E. Higginson, who accompanied her at the piano. Arthur Wallerstein played a violin solo, accompanied by Reno B. Myers. More than 600 were in attendance. Among those present were Mrs. L.S. Carter, Judge and Mrs. E.B. Jewett, Mr. and Mrs. H. Freeman, Miss Louise Freeman, Mrs. H.B. Allen, Miss Weston, Dr. and Mrs. J. L. Vickers, Mrs. Josephine Dennis, Mr. and Mrs. George H. Willis, Dr. and Mrs. J.L. Vickers, D.S. Coleman, W.S. Hadley, Mr. and Mrs. H.B. Damon, Mrs. J.M. Allen, Mrs. H.P. Wilson, Miss Marie Friend, Mrs. J.W. Clayton, Mrs. Pryor Smith and son, Mr. and Mrs. E.R. Chapman, Mrs. A.E. Baldwin, Miss Margaret Baldwin, Miss Jaquetta Downing, Miss Ethel Ricks, Mrs. C.W. Bitting, Mrs. J.F. Millhaubt, Mrs. E.M. Ogden, Miss Leota Schaefer, Mr. and Mrs. A.F. Jones, Mrs. E.H. Hurd, Miss Catherine Ryan, P.A. Keach, Mrs. B. Quilliam, Miss Blanche Wells, Mrs. W. Mitchell, Mr. and Mrs. C.L. Lyman, Mrs. Mary E. West, Mr. and Mrs. J.T. Casey, Mrs. M.B. Hawthorne, Miss Marie King, Miss Ethelyn King, Miss Stella McCanless, Mrs. Harry Adams of Beloit, Wisconsin, Mrs. C.J. Wright, Mrs. W.L. Thomas, Mr. and Mrs. John Kraft, Mrs. R.B. Warren, Miss Marie Berry, Mr. and Mrs. W.R. Hewey, Miss Ethel Hewey, Mr. and Mrs. W.K. Jones, Mrs. Sadie Dunks, Mrs. J.H. Berry, Miss Berry, Mrs. J.A. Stokley, Mr. and Mrs. W.C. Adams, Col. K.T. Bean, Mrs. Harvey Wattles, Mr. and Mrs. Hugh N. Roberts, Mrs. E.C. Sharp of Woodward, Okla., Miss India Queen, Mr. and Mrs. F.M. Jacques, Miss Nina Kasenberg, James Vincent, Mr. and Mrs. W.J. McClean, Mrs. Will Thomas, Mrs. C.T. Horstman of Kansas City, Mrs. C.E. Kiser, Dr. and Mrs. Walter Scott Priest, Mrs. W.H. McQuoin, Misses Anna and Nell Leahy, Mr. and Mrs. Joseph Tucker, J.L. Clarkson, Miss Eva Pratt, Miss Bonnie Burr, Mrs. A.J. Bell, Mr. and Mrs. Koster, the Misses Stuckey, Mrs. James F. Carpenter, Miss Elizabeth Stubblefield, Mrs. E.E. Stubblefield, Mrs. E.A. Russ, Capt. C.P. Thacher, Miss Jean Thacher, Miss Jeanette Stacey, Miss Marguerite Nelson, Mrs. Sallie Toler, Mr. and Mrs. P.A. Bone, Miss Mabel Crocker, Mrs. Ivan Bridges of Clovis N.M., Miss Pope of Kane, Ill, F.L. Holmberg, Mr. and Mrs. __ Holmes, Miss Jessie Clark, Mr. and Mrs. L.S. Trotter, Mr. and Mrs. E.M. Leach, Mr. and Mrs. Henry Ware Allen, Miss M.B. Taylor, Bruce Griffith and daughter, Mrs. J.F. Reese, Mrs. Smith, Laura A. Smith, Miss Jessica Smith, Mrs. J.V. Dougherty, Charles Lawrence, Mrs. D.F. Henry of Muskogee, Miss Amy Tucker, Mrs. H.E. Hueston and son, Miss Mary McClallen, Miss Teresa Henning, Miss Myrtle Gettys, Miss Alice Isely, Benjamin Truesdell, Mrs. Anna Brickman, A.W. Jones, Miss May Howes, Miss Hazel Howes, Mrs. Amy Bruce, Miss Jennie Cole, Mr. and Mrs. W.K. Jones, Mr. and Mrs. E. Higginson, Miss Marcia Higginson.